For the pianist, as well as all other instrumentalists, the major and minor scales are the very foundation for musical understanding, as well as mastery of the instrument. Mastering the scales on any instrument will not only help you know your instrument, it will also provide you a knowledge base for learning music and even composing your own music. Learning scales using a piano keyboard is helpful because it offers the most vivid imagery of each scale. Thus, learning the scales on the piano helps any musician's understanding of how every scale is constructed. This page will simply link you to a comprehensive listing of the scales, with easy to read images of the notes on the keyboard with piano fingerings, and the notes on the written staff. Learn to play the scales slowly, and hands-separately, at first. Then learn to play them with both hands and gradually build to faster tempos. This does not happen overnight. (Give yourself a few years to master the scales at fast tempos.) Include arpeggios, cadences, and Burlesque (a simple tune) for a complete daily routine that acts as a multi-vitamin for your piano-playing health. For demonstrations, go to SACB. Piano Chords Learn the chords on the piano from the most basic to the more complex. Also explore arpeggios, inversions, voicings, cadences, and progressions. A simple chart of the key signatures for reference and/or memorization. 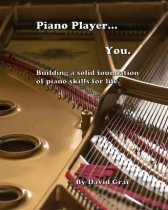 From basic exercises for beginners to advanced exercises, this page offers some advice and resources for developing your technique using the incredible array of exercises available to pianists. Take careful note of the practice tips. Reading Music Mastering the scales will greatly enhance your music reading at the piano. If you have not started developing your music reading skills, get started now using this plan. Go from "Major and Minor Scales" to "Free Piano Lessons"